We're in the process of redesigning one of Jira Cloud's key components—the issue view. Log in or create an account at the top-right of this page, then click Watch at the top-right to be notified about the latest goodies we're adding to the new issue view. Link to Confluence pages: Give your issues instant context with links to Confluence pages. Click the Confluence page quick-add button ( ) at the top-left of an issue, then choose from a list of recently visited pages or paste in a link to a page. Edit and delete work log entries: Click the Comments drop-down menu and choose Work log, then choose Edit or Delete for a work log entry. Press W to watch and unwatch issues: Speed up your workflow with a handy new keyboard shortcut. Press W when viewing an issue to quickly watch or unwatch it, just like in Confluence. When you watch issues, Jira notifies you when someone comments or updates other issue details. To make sure the right people are notified of issue updates, click the at the top-right of an issue to see and manage the list of watchers. Note: If you have the Tempo app installed, the W shortcut will continue to open the Tempo work log. We're working with Tempo on a more permanent solution. 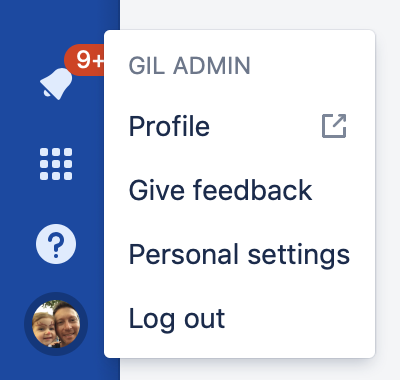 To turn the new issue view on or off in Jira Software and Jira Core for now, head to Your profile and settings ( ) > Personal settings and toggle the switch for the New Jira issue view. The new issue view is permanently on for all business boards and next-gen software projects. If you don't see the Personal settings option when you click your avatar, the switch to turn the new issue view on or off will appear under Profile.